I sold vacuum cleaners when I was in college – Electrolux, in case you’re wondering – and it’s no exaggeration that door-to-door sales taught me survival skills more essential to modern life than did the several universities I attended. “Don’t wait for the customer to come to you. Go to them!” It’s the underlying tenet of door-to-door sales and is a core premise behind the Pedaling Astronomer Project. I demonstrate astro tech wherever people are gathered outdoors, and showing up on an odd-looking bicycle is a great conversation starter. It gets me in the proverbial door, and as every seasoned door-to-door salesperson knows, the hardest part of the job is getting in the customer’s door. Another key to closing the sale was, “Put the product in their hands,” and when it comes to leveraging solar astronomy for outreach, no astro tech delivers enhanced hands-on solar-viewing experiences more naturally than Lunt Solar System’s SUNoculers. I’ve handed them to kids as young as age six and to seniors in their 90s, and none had trouble, once shown, adjusting interpupillary distance or achieving focus, much less finding the Sun with the binos. Elementary-school kids enjoying first views of the Sun. Notice the young man in the rear left using the SUNoculars. 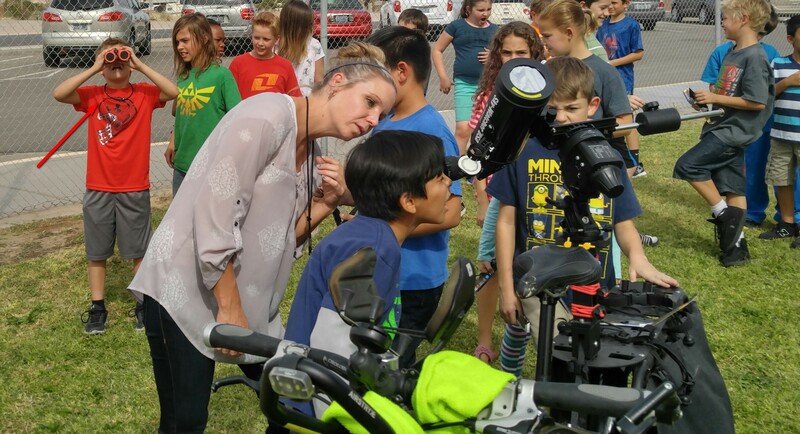 Most students required a bit of guidance while first trying to find the Sun in the eyepiece of the telescope, but they needed no assistance when using the binos. Lunt’s white-light SUNoculars come in two configurations: (1) an 18-ounce (510 grams), 8×32 center-focus version with 13.6-mm eye relief and adjustable eyecups, priced at $129US, and (2) a 10-ounce (283-gram), 6×30 “mini” version with individual-focus eyepieces, 9.0-mm eye relief and fixed eyecups, priced at $29.95US. I requested the 8×32 version, and the sample I received was Lunt’s “red” option, although the actual color of its tough rubberized armor looks more coral to me than red. Truth is, though, I prefer coral to red, not that the color of their armoring has anything to do with how they perform. Speaking of armor, these things are rugged. They arrived in perfect collimation, and they remain in perfect collimation, despite having been transported thousands of miles over cracked pavement – and often over no pavement – in the cargo bags of a too-heavy bicycle with no more suspension than the bit of give its tires provide when inflated to 65 pounds per square inch. The pounding ride of the Surly Big (that’s what I call her) has destroyed more than one item of high-end astro tech since we hit the road in May, but the Lunt 8×32 SUNoculars still look and perform like new. Their center hinge is firm enough to hold interpupillary distance wherever the user sets it, but smooth enough that resetting it is natural and intuitive. Ditto the action of the center focus knob – smooth, predictable and stable. Despite their affordability, Lunt’s 8×32 SUNoculars feel solid and exude mechanical quality. The center hinge incorporates a threaded insert for accepting a standard 1/4-20 binocular mount bracket. It’s covered with an included screw-on cap when not in use. The eyecups extend out with a counterclockwise twist, and even this action is smooth and predictable, extending the cups in three click-stop stages that help ensure both are adjusted to the same distance. I don’t carry a tape measure or calipers on the bike journey, so have no way of measuring the precise extent of the eyecup extension, but my guess is between 9.0 and 10.0 mm. Whatever the distance, I view sans eyeglasses and prefer the cups fully extended to better shield direct and indirect sunlight when viewing Sol. Those of you who view while wearing eyeglasses will likely need to observe with the eyecups fully retracted to get full benefit of that 13.6-mm of eye relief. When fully retracted, the leading edge of the cups are within a couple of millimeters of the outer elements of the eyepieces. The 8×32 SUNoculars ship with a soft nylon case, a neck strap and front and rear caps. About those caps: I was recently treated by an avid birder to some oh-so-sweet Swarovskis, and although their optics were truly exquisite, their hinged eyepiece caps refused to stay on. Not so with the SUNoculars. The rear caps are joined, as were the Swarovskis, but they fit superbly and remain firmly in place, as do the front flip-down caps. They are perfectly executed and have proven durable enough to withstand the thousands of hands that have already pulled them on and off. And about that 8x magnification: I learned long ago that, while I am capable of viewing with 7x binos handheld without distracting image shake, not so at 10x. Therefore, the binoculars I use most often for scanning the Milky Way are 7x50s, not 10x50s. Lunt’s 8×32 SUNoculars have taught me that my hands are steady enough for pleasing handheld views at 8x, too. Of course, it helps that the SUNoculars are much lighter at 18 ounces than my favorite 7x50s. Okay, they’re refined and durable, but what about the views? Well, given that I’ve used nothing comparable against which to evaluate them, I can only describe what I’ve seen through the SUNoculars, and what others have reported seeing. I’ve seen Sun spots in unexpected detail, given that I was viewing them at just 8x by hand. I’ve even seen a hint of surface granularity, which I also did not expect at 8x. Perhaps it was my mind’s eye supplying those details from memory, but I doubt it. I’m not that imaginative. I expected a bright-ish haze surrounding the Sun, but no, there’s none of that. These solar-specific binos render a surprisingly dark background sky. On a few occasions, I’ve seen birds and airplanes silhouetted against the Sun, also in sharp detail. Don’t you love it when your expectations are exceeded?! More interesting to me is what others report when they use the SUNoculars. The most common comment is, “WOW!” Given that the binos deliver so many first views of the Sun, that reaction is not surprising. What is surprising is how many of my guests also say, “It looks like the Moon!” which I take to mean that the white solar disc against the black background sky produced by the SUNoculars is reminiscent of the full Moon against a dark sky, and which I therefore consider a compliment. I check the Sun daily with the SUNoculars (assuming skies are clear), now that I carry them everywhere on the Big, and not just because they are so much easier to deploy and share than the solar scopes I carry. I also like that viewing with both eyes is more immersive. But yes, the binos do get more use if only because they require no set up. On days when predominant clouds allow only brief views of the Sun, it isn’t worth setting up and aligning a telescope, but the binos are ready in an instant. Lunt’s website reports: “The light of the Sun is reduced to a comfortable 1×10-5 transmission, and all ultra-violet and infrared components are completely and safely blocked.” As with the eyecup extension, I’ve no way of measuring this. Instead, I can only attest that I’ve now used the SUNoculars hundreds of times without negative impact on my vision. Views of the Sun through the binos are bright, but comfortably so. For those of us who live in the U.S. or are planning to visit on August 21, 2017, there’s a total eclipse of the Sun in our futures. But you already knew that. Anyway, you’re going to be very busy that day, helping family and friends get the most out of what for many of them will be a once-in-a-lifetime experience. The eclipse is a great excuse to invest in that dedicated solar scope or solar telescope filter you’ve been wanting, and you’ll want to have enough solar glasses on hand for all. But while solar glasses are as intuitive to use as Lunt’s SUNoculars, and are also blessedly affordable, they don’t magnify the solar image. 8x is a meaningful enhancement that yields a far more intimate perspective of the Sun. 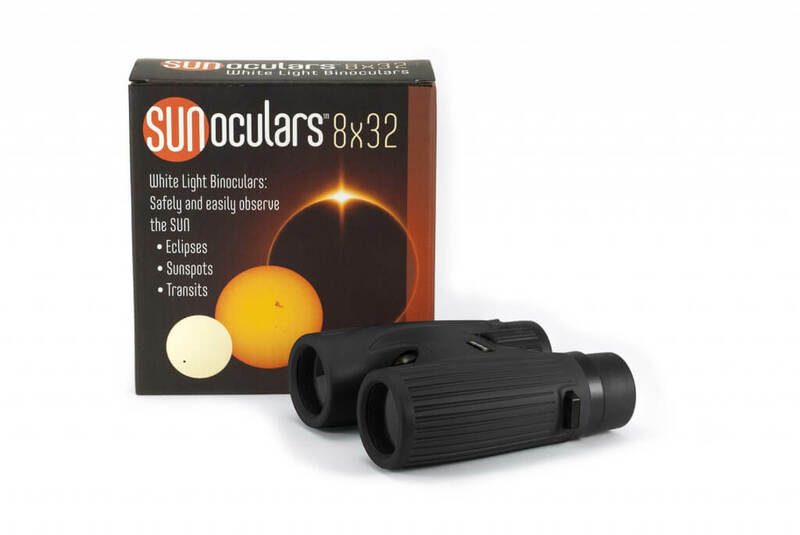 Add that they provide an intuitive, hands-on experience, and you begin to see what makes these solar binos such an effective bridge between also-intuitive but zero-magnification solar glasses and the hands-off, stationary experiences of higher-resolution solar telescopes. Bottom line: I do solar-centric astronomy outreach almost daily these days, and having used Lunt’s 8×32 SUNoculars in that role, I don’t want to imagine being without them – not day-to-day and certainly not on the big day of the 2017 Great American Solar Eclipse. My advice? Get yours now before demand overwhelms supply, because just as with hotel rooms and campsites along the eclipse path, those who wait too long to score SUNoculars of their own will find themselves left out. Just saying.